Professional and do-it-yourself painters love the way HANDy Paint Pail and HANDy Paint Pail Pro Series make their jobs easier. Both have their own set of custom fit accessories that make painting time-saving and easy! Introducing the NEW HANDy Ladder Pail. The multi-use pail for all your project needs. It's the safe way to transport your paint and tools and down a ladder! The HANDy Paint Pail was designed to make your painting projects a breeze! Ruggedly constructed for both professional and do-it-yourself painters, the HANDy Paint Pail will withstand years of use, is solvent resistant and works with any paint or stain. The HANDy Paint Pail is easy to clean and makes wash-ups fast and effortless. Also, check out the HANDy Paint Pail Liners and Disposable Paint Pail Covers! 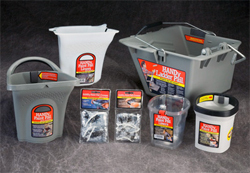 The HANDy Paint Pail Pro Series was designed for larger painting projects. Ruggedly constructed for both professional and do-it-yourself painters, the HANDy Paint Pail Pro will withstand years of use, is solvent resistant and works with any paint or stain. The HANDy Paint Pail Pro is easy to clean and makes wash-ups fast and effortless. Also, check out the HANDy Paint Pail Pro Series Liners and Paint Pail Pro Series Covers! The HANDy Ladder Pail's large capacity makes it perfect for painting, washing windows, carrying tools, cleaning gutters and any other indoor or outdoor projects. Ruggedly constructed and easy to clean, the HANDy Ladder Pail will will make all your projects safer and easier!